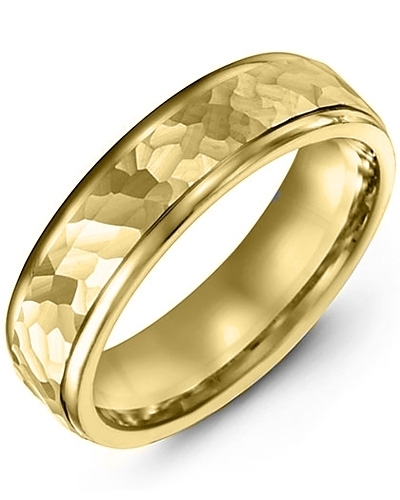 MOZ - Hammer Design Polished Edges Gold Wedding Band If you are looking for a minimalistic wedding ring with modern detailing, this Hammer Design Polished Edges Wedding Band could be it. Hand-crafted to the highest standards, it features a classic flat band, a delicately hammered insert, and polished edges for just a hint of contrast. Both the band and the insert are available in white or yellow gold, and 10kt, 14kt or 18kt options. Engrave your wedding date on the inside to create a bespoke piece. If you are looking for a minimalistic wedding ring with modern detailing, this Hammer Design Polished Edges Wedding Band could be it. Hand-crafted to the highest standards, it features a classic flat band, a delicately hammered insert, and polished edges for just a hint of contrast. Both the band and the insert are available in white or yellow gold, and 10kt, 14kt or 18kt options. Engrave your wedding date on the inside to create a bespoke piece.